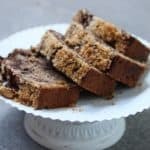 This chocolate swirl walnut pound cake made me look back these past years. A few years ago I ventured into the gastronomic business with a small café, something you probably know if you come here often. I closed it (sold it) a few months ago, have absolutely no regrets whatsoever of any shape, size or form, just in case you’re thinking how sad, and got my life back. Now that I have more time, and before it magically disappears again, for whatever reason, I decided to start investigating certain things I had on my mind for the longest time, like nut pastes and creams. I am very familiar with the well known frangipane (almond cream), a mixture of almonds, sugar and eggs mainly, and an extraordinary base for fruit tarts, like pears, peaches, plums, figs, or apples as in this crackly apple almond tart. The almond paste is the first step when making almond cream, where the nuts are ground with powdered sugar and a binding ingredient is added, in my case egg whites, though I’ve made it with honey and corn syrup too. I often wondered why other nuts where not used as often as almonds. I mean, pistachios, hazelnuts, walnuts, all marvelous flavors to use in fruit tarts. Or as is the case here, in a gooey, tender walnut chocolate pound cake. 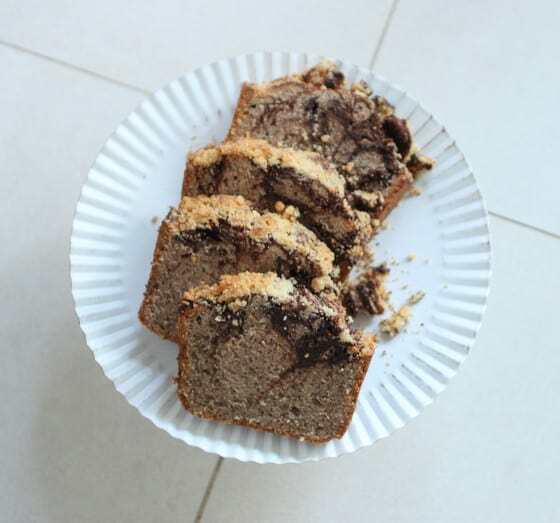 So, taking matters into my own hands, I made a walnut cream and used it in this cake, where it is treated almost as a butter and then swirled with chocolate, before a crumble is added on top. Simply wonderful. This is a pound cake with a texture unlike a regular pound cake. It is more buttery, not so doughy. Any nut goes well with chocolate, so feel free to change the flavor. 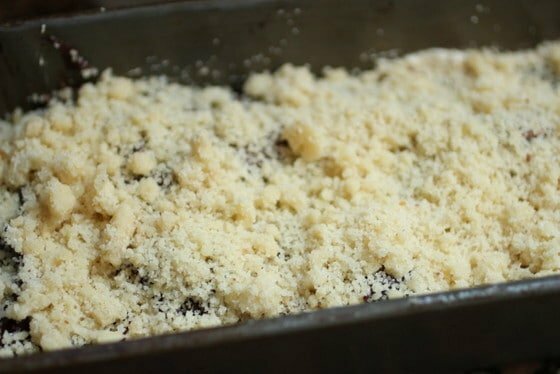 The crumble is a nice and crunchy surprise, which might seem too much, but it works. Being this a very rich cake, if you have to feed many people, it’s a good idea to bake it in square form, and cut it in smaller pieces. Or serve it with coffee after a meal for a perfect sweet bite to end the night. Preheat oven to 350º. Butter or spray a non-stick 9×5 inch loaf pan. In a large bowl with an electric mixer, or the bowl of a stand mixer, cream butter with baking powder. Add sugar gradually and then walnut paste and beat for 2 or 3 minutes. Add eggs, one at a time, beating well after each addition. Remove from the mixer and add flour in three additions, mixing well with a spatula. 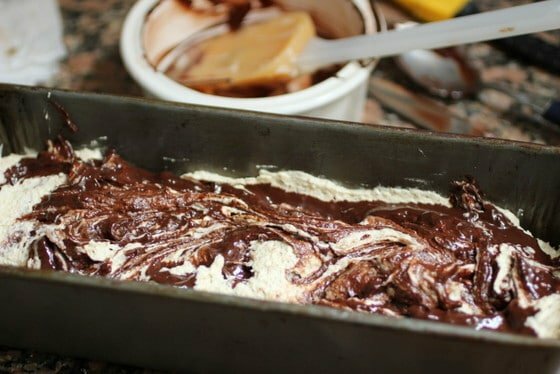 Pour into prepared pan, level batter and add chocolate on top. Swirl with a knife, bringing some white batter to the top. Add crumble over batter and bake for 45 to 55 minutes or until a tester inserted in center comes out clean. Cool on wire rack and unmold. It keeps, well wrapped in plastic, for a few days. In the bowl of a food processor fitted with the metal blade, put walnuts and powdered sugar. Process until well ground and mixed. Add egg white and continue processing until a crumbly paste forms. Keeps well covered and refrigerated for a few weeks. In the bowl of a food processor fitted with the metal blade, mix flour and sugar. Add butter and process until crumbly. Do not let it form a ball. Paula, "walnut paste" sounds interesting. We almost always get the walnuts here from France and they start appearing in the markets in September, eagerly anticipated by many people. 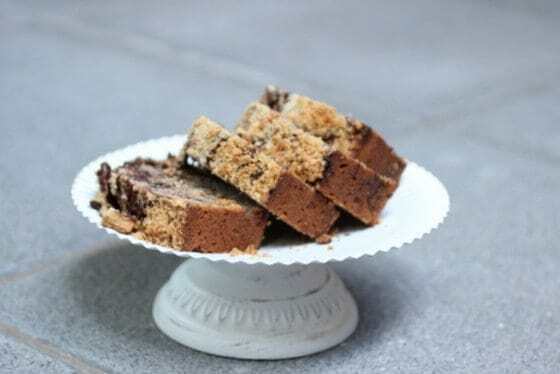 I use them extensively for all kinds of dishes and baking but have never made a "walnut paste" with them and I am sure that it adds quite some depth of flavor to your Chocolate Walnut Pound Cake. It does looks like a perfect cake to enjoy with that late afternoon cup of tea! I'm glad to hear that you're happy with your decision to move on from the cafe. It's always good to try new things, give it a good shot, and walk away with a smile if the fit just isn't there. Oh, Paula, this looks amazing! I love walnuts – and chocolate. People are always telling John & me that we should open a restaurant, but I really think it would take all the fun out of cooking for us. I wouldn't be able to deal with the complaints & throwing food away. I can only imagine how much work this was for you. I'm just glad you're here! My challenges were with employees (most of them so young and with such little interest in their job), and with the million (accurate number) of things to cope with every.single.day that had nothing to do with food or enjoying the customers. That is one tasty looking cake! Love the crumb! Thanks Alice, I´m much happier now! This looks like an utterly incredible recipe. And as for the post, what wonderful words. I often think running a little cafe would be fun, but I know the reality could be hugely different. Very honest, fascinating post. That cake looks incredible! Such a good idea to make paste with other nuts. I made almond paste for the first time last summer and instantly fell in love. I love the crumb topping on top of this delicious looking cake. Sounds and looks wonderful. I was glad to read you have no regrets about your choice. I guess people often romanticize owning a little cafe without realizing how stressful running one can be! And now you have the time to make all these beautiful things (and share them with more people). Beautiful cake! I am totally with you about gastronomic biz…used to work in the hotel restaurants (well, that's not even my own business) and I had enough with long working time…I meant 14 hours a day was normal, 16 hours wasn't anything special.. The cake looks really rich, bet it tastes super! I would love to try the walnut cream. That cake looks stunning and so are the pictures! Nothing beats Almond cream,it's so tasty! Cut in smaller pieces??? Not for me. I'll take a big fat slice of this cake. I love rich cakes. I'm dying to try the walnut paste too. I often think about how life would be if I quit my day job and opened up a bakery. I'm a realistic gal – I know the hours are brutal, it's physically and mentally exhausting, and it's hard to make money. I'll just have to keep the baking as my personal hobby and make cakes like this one for myself. This looks amazing, Paula – I love that golden crumb on top and those delicious chocolate swirls. Walnuts are my favourite nut to bake with. I can't wait to try this. Baking for work is so different than baking whenever and whatever you wish. I am very happy to be able to bake for pleasure and manage my own little kitchen. I am glad to hear you are enjoying developing new recipes, as we your readers are pleased with your creations! 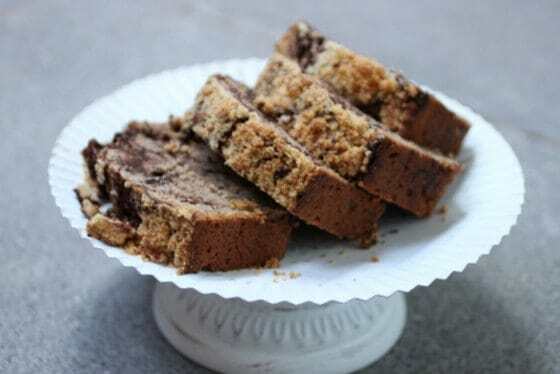 The Chocolate Swirl Walnut Pound Cake is a perfect example of delicious! This looks absolutely spectacular. Pound cake is one of my favorites, but this takes it to a whole new level. Love the addition of the walnuts. Congrats on this new chapter!